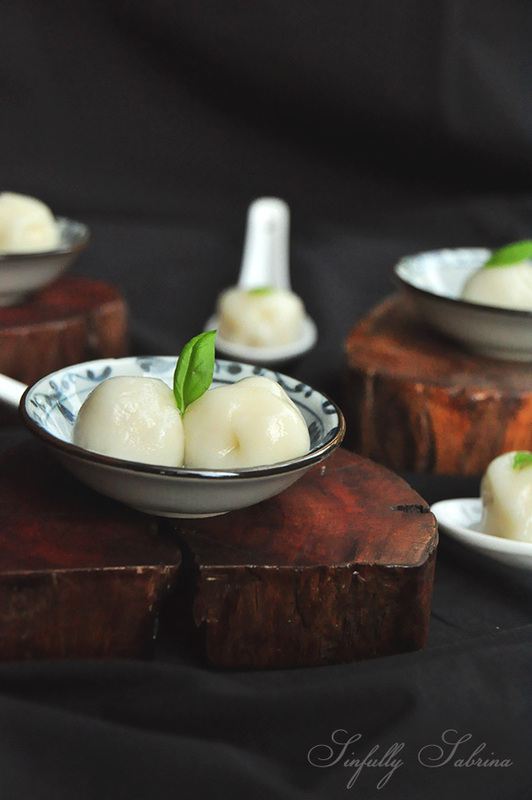 One of my favorite bloggers Lady and Pups published an amazing recipe for Peanut Butter Sticky Rice Balls in Green Tea. I was insanely inspired by this post and I knew instantly that I was going to come up with a Filipino version of it. Glutinous rice balls here in the Philippines are usually made into palitaw (a small and flat rice cake with sugar and sesame seeds) or ginataang bilo bilo (a sweet coconut cream soup with glutinous rice balls, ripe jackfruit, sago pearls, etc.). Well, that's just a few of the many Filipino dishes that use glutinous rice balls. Needless to say, we adore those sticky little things. In my fridge was a bottle of basil syrup leftover from my Strawberry-Basil Lemonade post. That's when I remembered that I wanted to incorporate that syrup into a Filipino-inspired afternoon snack. I hope you enjoy this unique dessert as much as I did! Mix water and glutinous rice flour until you have a dough. Make sure it's not stick but rolls nicely. In a small saucepan heat the sugar and water until sugar is dissolved. Turn off the heat and add the basil leaves to infuse for 10 minutes then fish out the leaves. Set aside but keep warm. Place coco jam in a piping bag with a thin tip. Roll into 1 + 1/2 Tbsp. balls and start pinching the sides to make a shallow cone. Pipe in the coco jam in the center and seal well to make as close to a ball as you can. In a pot of boiling water, dump the stuffed glutinous rice balls in and leave until they float. Remove with a slotted and place them in an ice water bath. 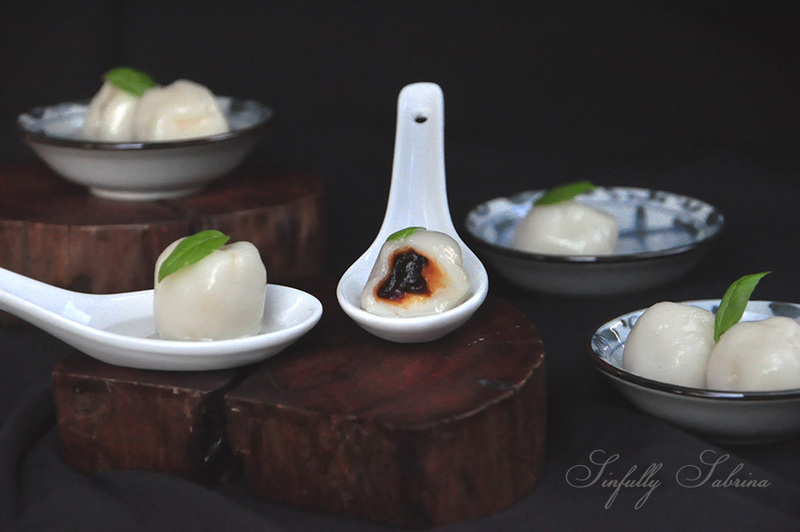 Serve the stuffed glutinous rice balls with the warm basil syrup and garnish with small basil leaves on top.